Nick Williams is set to make his major league debut at Citi Field on Friday night. For nearly three months, Phillies fans have pleaded with the front office overseeing the team with the worst record in baseball to infuse life onto the roster. If they couldn’t watch winning baseball, at least the Philadelphia faithful could come together and shout Promote the Prospects!! in unison on a daily basis. General manager Matt Klentak is throwing them a bone on the final day of June. With Howie Kendrick (hamstring) headed to the disabled list for the second time in just over two months, the Phillies have promoted outfield prospect Nick Williams to the big league club. The 23-year-old Williams, one of five prospects the Phillies received from the Texas Rangers in the Cole Hamels’ trade two summers ago, will make his major league debut at Citi Field in New York tonight: he's batting sixth and starting in left field as the Phils attempt to win their third straight game. A left-handed hitter known for his quick bat speed but questionable plate discipline, Williams was hitting .280 with a .328 OBP, 15 home runs, and 16 doubles in 78 games at Triple-A Lehigh Valley. 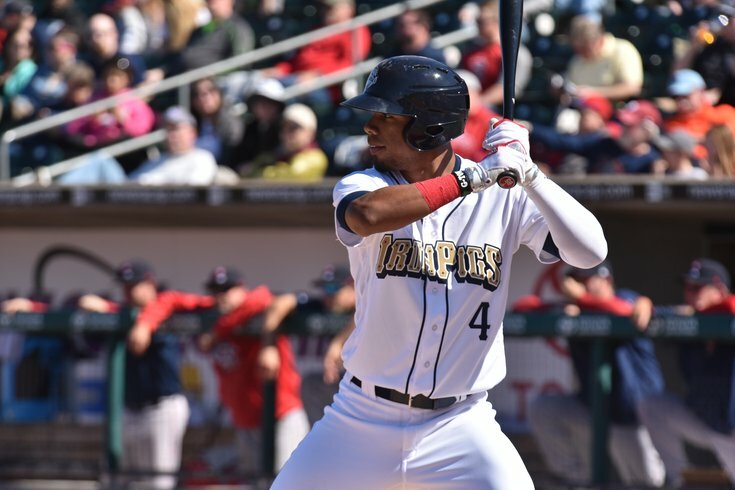 Williams had 90 strikeouts and 16 walks in 282 plate appearances this season with the IronPigs. Williams’ bat has been a consistent cog in the Pigs lineup all season, but he’s been on a tear in the last six weeks, hitting .308 with a .361 OBP, and 13 home runs in 42 games. With Kendrick on the DL and Ty Kelly and Andres Blanco expected to split time at second base, where Kendrick had played since starter Cesar Hernandez was placed on the DL earlier this month, Williams figures to get the majority of reps in left field, with Odubel Herrera in center and Aaron Altherr in right, while he’s with the major league club. Williams, who turns 24 in September, was in his second season at Triple-A. He had a down year in 2016, slashing .258/.287/.427 with 13 home runs, 136 strikeouts, and 19 walks in 125 games. This year he already had more home runs and, after collecting six walks in his last six games, was three shy of tying that total from last year, too. Earlier this month, while in the middle of a home run binge, Williams admitted he was putting too much pressure on himself a year ago. “Last year I was trying to make the big leagues every day,” Williams said three weeks ago. “Now (I know) it’s not my decision, I don’t pay attention. I don’t know who’s doing what up there, I don’t even know who’s playing. I turned my MLB app off for Phillies notifications, all of that. So I just said, you know, I’ll go day by day, pitch by pitch, make adjustments and, you know, it’s never over. And now his time has arrived.